narrowboat_Abigail_Jenna: Dry dock and beyond. 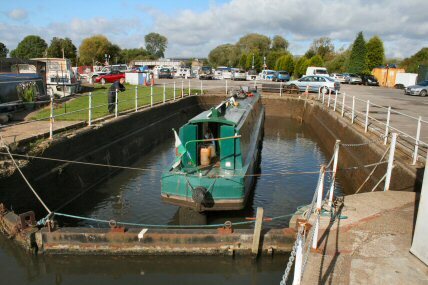 Its time to get off to the drydock at Stanilands Marina. 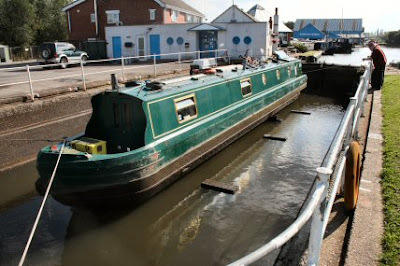 The original idea was to be taken out of the water on a trolley but because Abigail Jenna is on the limit of the size it was decided that a week in drydock would be better. 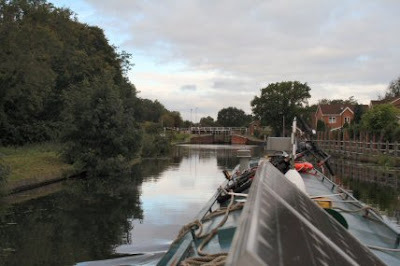 The width of the canal at Thorne Boat Services is just enough to spin the boat round but it was a little tight with wind and the bridge so close. 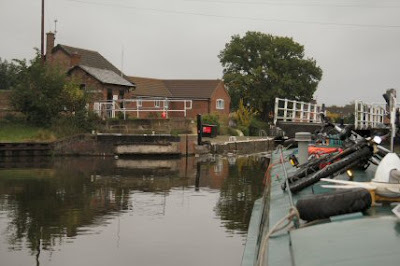 It isn't far to Thorne Lock but it is still nice to be moving even if it is only for a short time. Through the lock and the drydock is in front of me. Full of water and in we go. The boat is soon centred up over the - whatever they are called - and secured fore and aft. As soon as the water goes down a bit wedges are slotted in to ensure the boat stays upright. The first thing I do is to give the boat a good pressure washing. 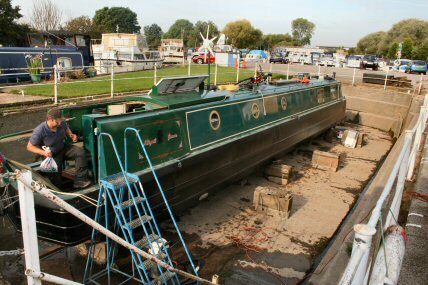 Then I scraped the hull and gave the same a wire brushing and afterwards another pressure washing. 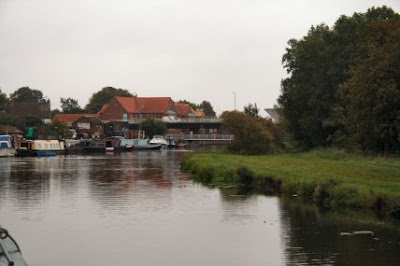 There were several comments on the state of the hull and the age of the hull all of which were very positive. The next day the old drive and prop were removed. 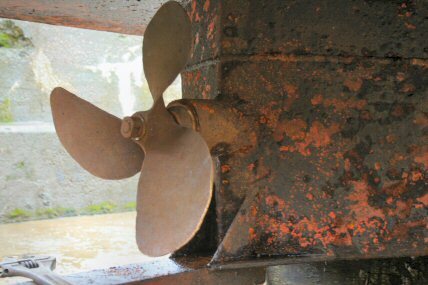 The old prop looks a bit rough now. 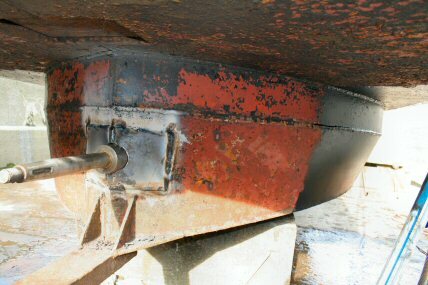 The old stern tube is cut out and removed. 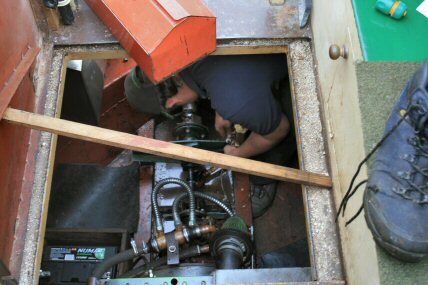 An old prop shaft is fitted and bolted to the gear box. This then enables the new shaft to be in line with the engine before the new stern tube is welded in. 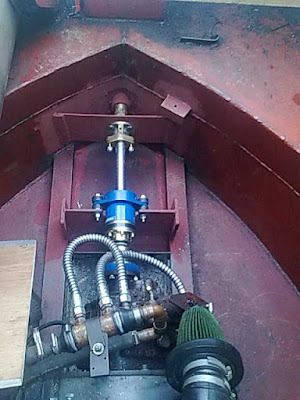 The new stern tube in place and welded. 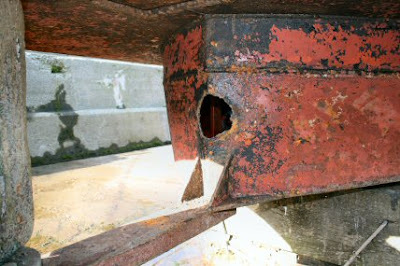 During the few days I have been in the dock I have cracked on with the painting of the hull. Being in the open I decided to get it finished asap. The whole hull had four coats of bitumen. 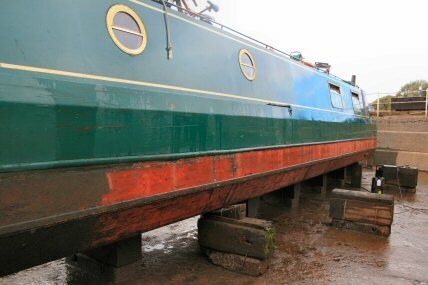 Then the part of the hull below water had another coat and the section of the hull at water level had another coat. It is astonishing how many brushes full of paint is to be found in 20 litres. The new shaft and drive in position. Oooh smart. The underside of the boat is not like the usual narrowboat. 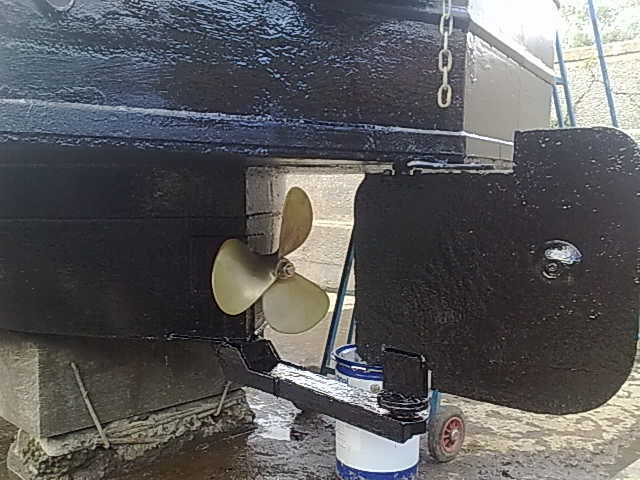 This Springer has - as well as the angling on the bulkhead - a keel and slight angle beneath where on other boats its all flat. The new propeller really looks the business. I am quite looking forward to seeing what it can do. Its Monday and the moment of truth. The outlet to the dyke is closed and the sluice in the gate is opened. It takes 45 minutes to fill up the dock. The boat floats. Hooray. The dock gates are opened to let me out. 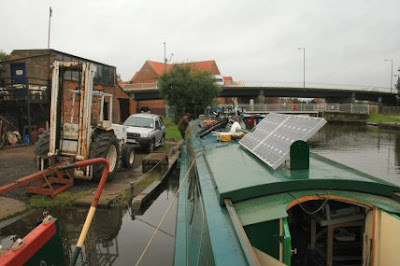 The boat is pulled astern by rope and I was asked not to use the engine till the boat is over halfway out of the dock so that mud isnt moved into the dock. Fair enough. 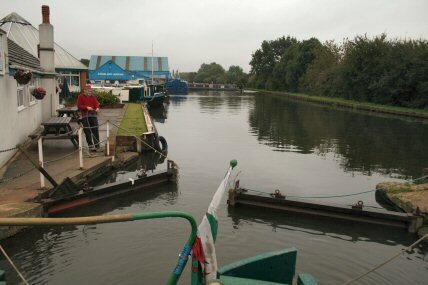 So I am half way out and shove the control in to ahead and I find I am moving back into the dock. Bugger. The new prop is different handed so that ahead means astern and astern means ahead. 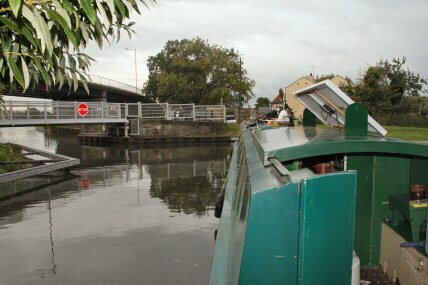 It took a while to get through the lock as the Waterscape boat was coming up. Sadly I couldnt get my key out of the lock controls so I worked the lock for them. Bit of bad news. 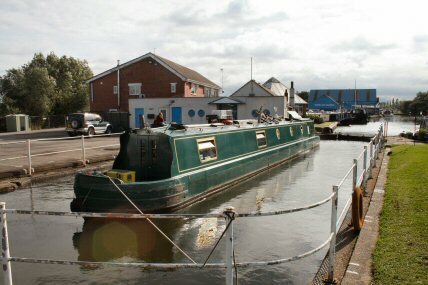 The funding for the Waterscape boat has run out and it was moving from Blue Water Marina to Goole. I hope they come up with funds soon. 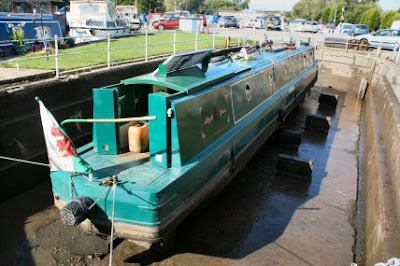 The boat is well used for training and outings for various groups. Back to Thorne Boat Services. A lot of shuffling of boats. The whole of the mooring is two deep and in places three deep. 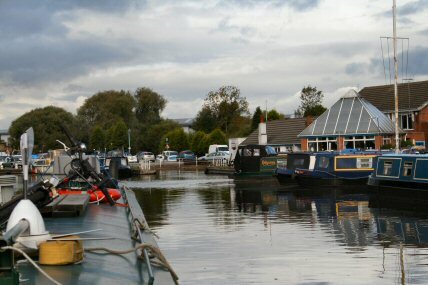 I do like to see small yards with a queue of boats waiting to be sorted. Today the new control was fitted and tomorrow a hole for the aerial is being drilled. Fill up with diesel and a new gas canister and I am ready to leave for Lincoln. So are you running in reverse all the time now. Some gearboxes don't like that.